On Wednesday, The New York Times published an extensive interview with PayPal cofounder and Gawker-destroying billionaire Peter Thiel, a man who, though we have never met, seems totally regular and cool. 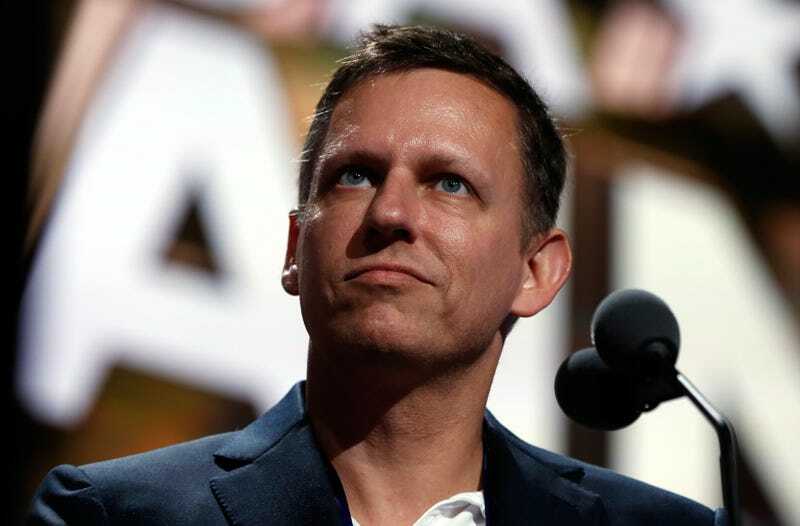 As a venture capitalist (and early Facebook investor), Thiel has long been a major player in Silicon Valley, but gained national political prominence after speaking at the Republican National Convention last year, contributing $1.25 million to Donald Trump’s campaign and even joining the President-elect’s transition team. Touching on topics ranging from his relationship with Trump (who declared they’re “friends for life”) to the relative merits of Star Wars versus Star Trek (as a capitalist, he prefers the former), Thiel gave a variety of perfectly reasonable answers during his exchange with the Times. Below are 11 of the most normal quotes from the interview. “I like ‘Star Wars’ way better. I’m a capitalist. ‘Star Wars’ is the capitalist show. ‘Star Trek’ is the communist one. There is no money in ‘Star Trek’ because you just have the transporter machine that can make anything you need. The whole plot of ‘Star Wars’ starts with Han Solo having this debt that he owes and so the plot in ‘Star Wars’ is driven by money.